Scrumptious Tiger prawns in egg fried rice with peas. Little brother to the King Prawn, shrimp in egg fried rice with peas. Spicy egg fried rice with a dash of curry powder, spicy chilli oil and shrimp. Tender Beef slices in soy season and egg fried rice. 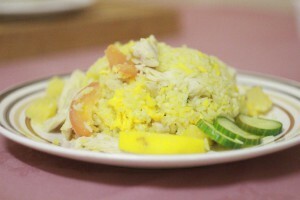 Tender chicken slices in soy season and egg fried rice. A crowd favourite. Egg fried rice with tomato and cucumber in Thai fish oil and soy seasoning. The Hong Kong staple, egg fried rice with beef, chicken, pork, a drizzle of gravy and an egg omelette on top. Gorgeous.